I only have so much virtue in my body. I try to eat well and feed my family healthy foods, and I do a pretty good job of it most of the time. But every so often, I spend all my good behaviour on things like parenting, being honest and moral, and tidying up. At the end of my virtuous rope, I fall straight into recipes like the one I’m sharing today. You know those recipes you have to drop everything and make right away when you hear or read about them for the first time? This is one of them. I’ll get it right out of the way now and tell you this is full of fat, sugar, flour, cream, candy, chocolate, and all sorts of other things that are dreadful for your waistline. I’m also going to tell you it doesn’t matter and you should run out to get the ingredients right this very instant. …And hey, the recipe comes with a story. Who doesn’t love a story? Well, you KNOW I called my dad. He described a dessert that one of his camp groups had prepared. Yeah, I know… Camp food has a bum reputation, but that’s just with people who haven’t stayed at one of my dad’s camps. 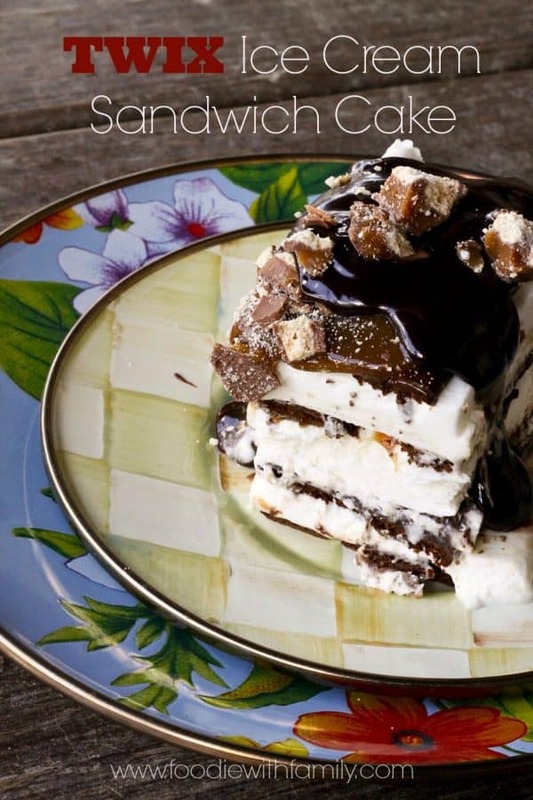 He told me that the group had arranged ice cream sandwiches over the bottom of a 9-inch by 13-inch pan, topped it with chocolate sauce, caramel, whipped cream and another layer of ice cream sandwiches. I went straight to the store. …But I had a plan to make this decadent dessert just a little more over the top because I tell you I not only had used up all of the day’s quota of virtuous behaviour, but I had started running a deficit. Something needed to be done. Into my cart went two boxes of ice cream sandwiches (no baby sandwiches, no sirree Bob, I went straight for the big gun normal sized ones), a jar of butterscotch caramel, a roll of aluminum foil, a pint of heavy cream, and four king sized Twix bars. I was going to make a Twix Ice Cream Sandwich Cake. What? Yeah. I told ya, I was in the red. I needed something naughty fast. *Pro Tip from having worked at an ice cream counter in my teen years. Freeze candy bars and they’re easier to break up for topping cakes, including in cookies, milkshakes, and whatnot. The second box of ice cream sandwiches was arranged over the top and gently pressed down into the whipped cream then smeared with the rest of the butterscotch caramel sauce and two more -COUNT ‘EM TWO!- broken king sized Twix bars. The whole shebang was shoved back into the freezer to firm up for a couple of hours. The boys and I waited not at all patiently (because they, too, had exhausted all of their good behaviour far earlier in the day) for those couple of hours with forks in hand. When the timer chimed, I pushed my way past them to retrieve our Twix Ice Cream Sandwich Cake from the freezer. I used the foil cradle to lift the cake onto a cutting board and cut the whole thing into mighty generous portions, taking care not to destroy the foil. After removing a corner piece to a plate, I lifted it back into its pan. Each serving got a generous drizzle of Grandma Val’s Hot Fudge Sauce before being devoured. Whoa. Twix Ice Cream Sandwich Cake. Can I just say that again? WHOA. That oughta set me up to behave like an angel for a few days at least. If not, I still have a tiny little piece stashed in the back of the freezer in a cottage cheese container. What? Angels need sustenance, too. Leave the frozen candy bars in closed wrappers and beat them senseless with a rolling pin (not marble!) or a rubber mallet or a meat tenderizer. This pulverizes them without a mess! Then you can just open the end of the candy bar wrapper and sprinkle straight onto the dessert!! To see whether you have firm peaks in your whipped cream, lift the head of the stand mixer (or the beaters for the hand mixer) and look at the whipped cream, did it raise up into a peak that curled back over at the top? You probably want to whip for a few more seconds. Did it stay straight up in the air? Stop right there! If you go further, you’ll have butter!! 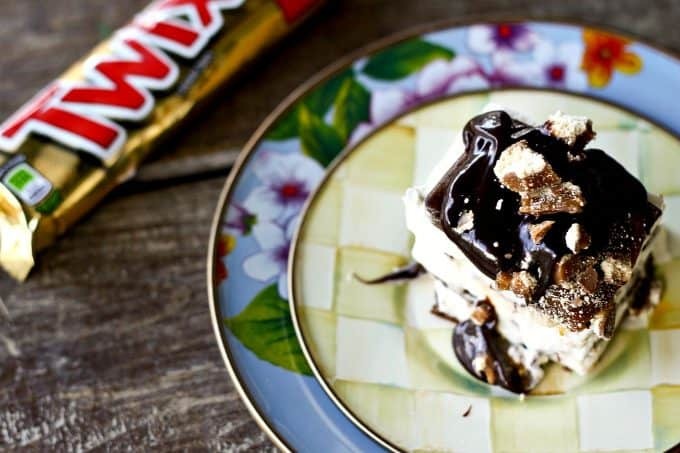 Gooey, creamy, drippy, and absolutely, unequivocally indulgent is the only way to describe the Twix Ice Cream Sandwich Cake. 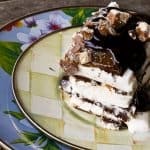 Ice cream sandwiches are sandwiched around real whipped cream, hot fudge, butterscotch caramel and crushed Twix bars, then topped with a thick layer of butterscotch caramel and more Twix bars. This is killing your diet in style! 1 cup hot fudge sauce Homemade is good but store bought is fine! 2 cups butterscotch caramel sauce homemade is good, but a 17 ounce container of store bought is fine, too! Press a sheet of aluminum foil into a 9-inch by 13-inch pan with a 2-inch overhang on each long side. This will act like a cradle that will help you remove the frozen cake for easier slicing if you wish. If you prefer, you can skip this step and cut it in the pan. Arrange one box of the ice cream sandwiches in a single layer on the bottom of the pan, cutting if necessary. Warm up the hot fudge sauce if necessary to make it spreadable then use a silicone, rubber, or offset spatula to spread it evenly over the ice cream sandwiches. Put that in the freezer while you whip the cream to firm peaks. Remove the pan from the freezer and spread the whipped cream evenly over the hot fudge. Drizzle about 1/2 of a cup of the butterscotch caramel (warming slightly if necessary to make it pourable) over the whipped cream then open two packages of the broken Twix bars and scatter it over the top. Arrange the second box of ice cream sandwiches over the top and gently press them into the whipped cream. Spread the remaining butterscotch caramel over the top and toss the other two broken Twix bars over the top of the caramel. Put the whole pan into the freezer until very firm, at least 2 hours. If you are going to wait longer than 2 hours to slice it, cover it tightly with plastic wrap after it is firm to prevent freezer burn. You can either use the foil to remove the cake from the pan for easier slicing, or you can slice it in the pan. Optional: Drizzle each serving with more hot fudge sauce before serving. This post originally published July 26, 2013. Wow- your children must LOVE you. That’s all I have to say about this. 🙂 Well also that it looks outstanding!! Yum! I love how “naughty” this is… never think about freezing fresh whipped cream. 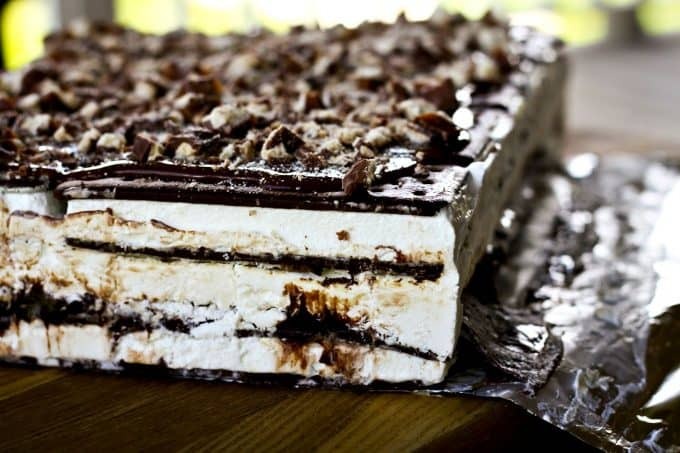 Although I’m a huge fan of it on ice cream cakes… must make this soon. Omg this looks AMAZING. Twix are my favorite. Loved the story! And can I say that I am more than a little jealous of your inside scoop on fabulous camp eats? Amazing!! What a fun cake perfect for summer parties! This cake is a freaking dream! And so easy! Love this recipe – perfect for the weekend! I am going to be EXTRA good this weekend so I can feel so not bad about making it early next week! SO.YUM. Wow, this looks delicious. I am going to a BBQ tomorrow and wish that it wasn’t 2 hours away so that I could make these to bring! I have never seen anything more beautiful than this! I’m going to die if I dont eat this……. Oh. My. Goodness!!!!!! That looks just CRAZY good! I want to make this right this very second. Holy moly! I love Twix and I love ice cream. This just makes so much sense. OMG I know all about that one. We made that ice cream sandwich cake and used Butterfingers crumbled on ours. I don’t do sweets. I eat dessert about 1-2 times a year. I had two helpings of this stuff. I’ll have to try your version.